With a groundbreaking body of work spanning six decades, it's Bowie's ability to evolve and reinvent himself and his music to be constantly relevant and influence generations of musicians that makes his loss so keenly felt the world over. Starting out in the 1960s, it took young Davie Jones a good few years to make his presence felt. His early R&B and skiffle-influenced work (check out Liza Jane by Davie Jones and the King Bees) evolved into charming Kinks-style English beat pop, and then, as the race for space captured imaginations the world over, Davie evolved yet again into pop-folk-psychedelic troubador David Bowie, and he never stopped moving forward. Here are 10 great Bowie tunes, charting the twists and turns, inventions and reinventions that characterised his incredible body of work. Bowie's 1967 debut had lashings of the kind of English eccentricity also peddled by The Kinks, the Floyd and The Beatles, with its clear nods to the music hall tradition. They sound quaint now, but tracks like Love You Till Tuesday nevertheless sowed the seeds for his later, more 'serious' work. Then, with self-titled album two in 1969, Bowie's career literally space-rocketed as he caught the space-age zeitgeist perfectly as all eyes were on the moon landings. Space Oddity, with its psychedelic hippy folk feel, space noises (yes, that's a Rolf Harris Stylophone) and its melancholic tale of Major Tom, passing 100,000 miles yet finding a strange peace, floating in an other-worldly altered state. The Man Who Sold The World (1970) is considered by many to be the birth of Glam Rock, but certainly it was the start of Bowie's transition towards his Ziggy Stardust persona, with the core of his Spiders From Mars band in place by the time of fourth album Hunky Dory. This 1971 classic opens with Changes, prescient of Bowie's future chameleon-like reinventions, while Life On Mars has surrealism and parody, as well as giving him one of his most memorable hits. 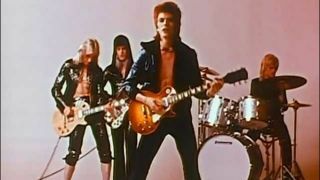 Bowie really went off-world here; his iconic reinvention as a rock-star in touch with aliens might not have gone down too well with his own band (Mick Ronson nearly quit when he was shown the band's new wardrobe) but the sheer out-there nature confounded notions of sexuality, posited the idea of rock as art performance and even got working class youth dressing up in outrageous gear to make themselves seen as well as heard. As a concept album it has proved incredibly robust too, and gave the world such incredible tracks as Ziggy Stardust, Moonage Daydream, Starman, Soul Love and more. Another alter ego, Aladdin Sane kept the glam look and lightning make-up of Ziggy to give the world this 'crash course for the ravers'. Influenced by Bowie's US touring, the album takes on American themes like doo-wop and drive-ins, while the psychedelia of his earlier work gives way to boogie rock'n'roll. This and Pin-Ups (1973) Bowie's follow-up album of covers of tracks by The Yardbirds, Pink Floyd, The Who and The Kinks would be his last with the original Spiders From Mars line-up. But the sleazy, Bo-Diddley-esque stompalong of The Jean Genie from Aladdin Sane (its protagonist said to be based on Iggy Pop) is a Glam masterpiece. After his theatrical, Orwellian concept album Diamond Dogs, Bowie changed persona yet again for his 1975 album Young Americans, for which he brought in soul and funk stars such as Sly & The Family Stone drummer Andy Newmark and a young Luther Vandross. Bowie himself described the Philly soul-influenced Young Americans as 'plastic soul', aware that he was a 'white limey' letting fly with his mid-'70s soul obsession to create one of his most danceable albums, in particular the grooving sax-crazy title track. Bowie's 'Berlin Trilogy' - Low (1976), Heroes (1977) and Lodger (1979) - saw the Thin White Duke develop a taste for all things German, as his music moved towards a more minimalist approach inspired by Krautrock, and hanging out with Iggy Pop (who recorded his seminal album The Idiot at the same time). Camped out in West Berlin, the Cold War looms large thematically, while working with Brian Eno ensured the music was ambient, atmospheric and dark. Heroes, about lovers who meet at the Berlin wall, remains one of Bowie's best loved tracks. After the wilfully experimental Berlin Trilogy, Bowie returned to huge commercial success and critical acclaim with Scary Monsters (And Super Creeps). Revisiting the character of Major Tom, with Ashes To Ashes Bowie reminded everyone what a musical force he was. The hugely memorable video with Bowie as creepy Pierrot clown walking in front of a bulldozer helped the tune to Number One, as music entered the MTV age and Bowie positioned himself to dominate the 1980s as he had done the '70s. Bowie returned to his love of soul and R&B for his most commercial and pop album, critically poorly received at the time (considered by many fans to be a 'sell-out'), the album nevertheless cemented his place as a world superstar and found him new fans, thanks to inarguably well crafted, delicious pop hits like China Girl, Modern Love, and Let's Dance, which remains one of his biggest chart hits. Bowie seemed to regret the commercial success that Let's Dance had brought him in the mid-'80s, and attempted to reassert himself as a left-field creative force with his rock band Tin Machine. Though far from Bowie's best work, and arguably lessened by the impact grunge was having at the time, Tin Machine's 1989 and 1991 albums did reinvigorate his career for the '90s, which saw the release of latter Bowie classics such as Black Tie, White Noise and Outside (come on, Hallo Spaceboy wasn't that bad). Bowie's 25th studio album, released two days before his death, is a fine swan song for the man, with his old collaborator Tony Visconti at the helm as he had been for 2013's The Next Day. His musical vision is undimmed, his voice as rich and beautiful, with key track Lazarus opening with the haunting lyric, 'Look up here, I'm in heaven,' both sad and gloriously optimistic. Bowie may not be reborn like Lazarus, but his immortality is assured.